Last year, Encore Music Publishers published my new book, The One Hundred: Essential Works for the Symphonic Bass Trombonist. The book contains my commentary along with music for 100 works in the symphonic (and operatic) literature that bass trombonists need to know both for auditions and concerts. In a sense, The One Hundred represents my collective knowledge of this repertoire that I have played many times over my long career as bass trombonist of the Boston (27 years) and Baltimore (4 years) Symphony Orchestras, as well as my over 40 years as a teacher. Upon publication, the book was submitted to the International Trombone Association Journal for review and last week, the review was published in its January 2018 issue. I could not have asked for a more respected person to write the review – Ben van Dijk (pictured above), who is President of the International Trombone Association, bass trombonist of the Rotterdam Philharmonic, and Trombone Professor at the Amsterdam Conservatory – nor could I have even hoped for a more enthusiastic assessment of my book. I’m very grateful to Ben for his kind words which I share below with readers of The Last Trombone, and I hope the book continues to be helpful for bass trombonists for many years to come. I have previously written about my time working at Duke Divinity School, and Duke Initiatives for Theology and the Arts. Led by Dr. Jeremy Begbie, the weeks I have spent in Durham, North Carolina working with DITA have been exceptionally rewarding. The photos and commentary I have previously shared gives you a glimpse into what we did with an orchestra of musicians all of whom are Christians — including several of my former colleagues from the Boston Symphony Orchestra as well as trombonists Megumi Kanda (Milwaukee Symphony) and Jim Kraft (National Symphony, retired) and how we were able to impact audiences with important, interesting messages of the intersection of music with faith. Duke Initiatives for Theology and the Arts has just put together a short video that shows more of what this special weekend last fall was about. I invite you to have a look (the video includes a short interview segment with me), and catch some of the excitement of that moment. Plans are already underway for more events. Have a look at this video, below, and lear more about Duke Initiatives for Theology and the Arts (to view this video in YouTube, click HERE). Last night’s American football AFC Championship game between the Jacksonville Jaguars and the New England Patriots was full of high drama. Full disclosure: I lived in Boston for nearly 30 years and attended more Patriots games than I can count. Before their astounding period of success began in 2001, I went to plenty of games when the team was, frankly, terrible. Today, the Patriots are heading to another Super Bowl. Their eighth since 2002. This is remarkable. My wife and I now live in Arizona, and we hold season tickets to Arizona Cardinals football. We love the Cardinals. But we still love the Patriots. There you have it. I’ve written about the Patriots before on The Last Trombone, particularly about quarterback Tom Brady and how he was the 199th pick in the 2000 NFL draft. Brady has used that fact – that teams passed him over repeatedly until the Patriots drafted him in the sixth round – to fuel his engine of excellence. The result: he has gone on to be what most football observers consider to be the greatest football player of all time – the G.O.A. T.
We spent yesterday afternoon with some friends who had invited us to their home to watch the AFC and NFC Championship games. When I watch TV, I rarely watch commercials. And I’m not particularly interested in pre-game commentary from talking heads. I like to watch the game. So when, before the game started, there was a segment with an actor I had never seen before, I didn’t pay much attention. Until I realized the piece was filmed in Jordan Hall at New England Conservatory of Music. STOP. Rewind the DVR. I taught at New England Conservatory for 27 years. I played countless concerts and recitals in Jordan Hall. What is this? The story about how this video came about is terrific. Recorded just a few days before yesterday’s game, students at NEC were featured in this short film. You can read how this all came together in a story in Sports Illustrated by Richard Deitsch. Click HERE to read his story. Sports and music. Sometimes they come together in a way that adds something to our joy of living, and when I see students benefitting from this, as the students at New England Conservatory of Music did when they were part of an exciting football game yesterday, I smile and remember the thrills I’ve had doing the same kind of thing. It’s amazing where life can lead when you have a trombone – or any musical instrument – in your hand. Last Sunday, before the morning worship service started at our church (Phoenix United Reformed Church), my wife came to me with a necktie in her hand. “Would you please tie this for Lloyd?” Lloyd is a good friend, a retired pastor, and in this season of his life — in his 80s — some tasks have become more difficult for him. “Sure,” I said. I put his tie around my neck, tied it, then slide it over my head to give to Lloyd. It took me about 10 seconds and I didn’t give it a second thought. It was a simple thing to do to help a friend. But that afternoon, I reflected on the very ordinary act of tying a necktie. Frankly, it’s not something I do much these days. Since moving to Arizona in 2012, I’ve switched from neckties to bolos. While I still have many ties — here’s a photo of just a few that I still have in my closet. . .
It’s a southwest thing, and bolos appeal to my artistic sensibility. Still, when I tied Lloyd’s necktie, I used the only necktie knot I know how to tie: the full Windsor knot. My mind turned to my father. It was he who taught me how to make this knot when I wore a tie. And every time I tie a tie, I am grateful that he taught me how to do this. In a sense, part of my father’s legacy to me is having passed down this simple thing, the act of tying a necktie in a particular way. He gave me other gifts as well, such as a love for reading. My mind continued down that road, reflecting on the legacy that many other family members who have also gone to their heavenly home gave to me. My mother’s love of music, my grandmother’s love of adventure, my father-in-law’s love of working with his hands. All of these people and many others had lives that intersected with mine in ways large and small. And each of us is the product of the investment that others made in us. They gave me things that are with me every day. Not physical things, but things that required their investing time with me, to show me how to do something, or how to think of something, or how to recall and remember something and then put it into action. Tying a necktie is not really such a big deal. But last Sunday morning, it reminded me how grateful I am for those who taught me things like this, and it was an encouragement to me as I have endeavored to pass things on to others. It reminded me of this: never underestimate the value of any kind of investment you make in another person. They may very well remember it long after you’ve forgotten it, long after you are gone. You may not have thought so at the time, but you made a difference; you wrote a small piece of your legacy. Like my father did when he taught his son how to tie a full Windsor knot so I could help a friend on a Sunday morning. The new year is upon us, 2018. Resolutions have been made and probably broken already. Such is our human condition: lots of good intentions but difficulty in being disciplined enough to follow through with them. 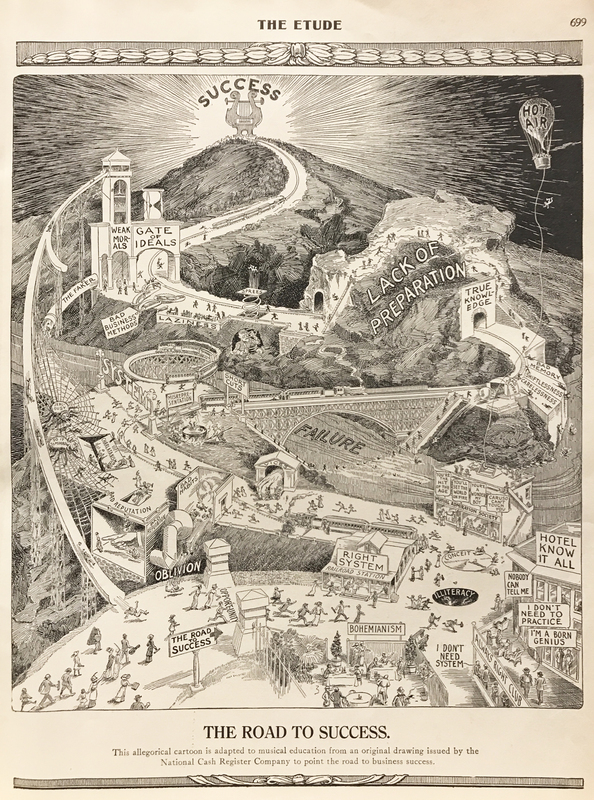 Most people I know want to be successful, and my son-in-law, John Freeman, recently shared an old cartoon with me titled “The Road to Success.” It dates from 1913, and I thought it was so interesting that I sought out an original copy. The Etude magazine, a long time publication of the Theodore Presser Company, printed it in its October 1913 issue. Presser modified a cartoon put out by National Cash Register company that was about the road to business success – you can view the original by clicking HERE – and Presser’s creative changes that point to the road to musical success are really quite clever. Here is Presser’s version of the cartoon. To download a high-resolution copy from my website, click HERE. If you follow the road to success, you see there are many pitfalls along the way. You need to keep your eyes open. Many people rush over the threshold of Opportunity but fall into the dark holes of Illiteracy or Conceit. Hotel Know It All has many rooms. So does the Mutual Admiration Society, from which the balloon Hot Air floats. And the Always Right Club has plenty of members. Vices lead immediately to the river of Failure; the same is true for The Faker. Bad Habits lead quickly to Oblivion – as does a Bad Reputation. Jealousy and the desire to Do It Tomorrow are portrayed as spiders with webs that trap many. Weak morals appear to be an elevator to the top of the mountain but actually send you down a chute right back to the beginning. Have a look at this view of “The Road to Success.” Over one hundred years after it first appeared, it is still fresh. World class players do not just happen — their talents are forged in the dual furnaces of determination and diligence. Go to the ant, O sluggard; consider her ways and be wise. She prepares her bread in summer and gathers her food in harvest. How long will you lie there, O sluggard? When will you arise from your sleep? And poverty will come upon you like a robber, and want like an armed man. The desire for shortcuts is always with us. A few weeks ago, I was at Dordt College in Sioux Center, Iowa, where I gave a trombone masterclass and performed a concerto with the Northwest Iowa Symphony Orchestra. As I was walking around the college’s music building, I spotted this cartoon on a bulletin board. It made me laugh, and shake my head. You’ll probably laugh, too, and then sadly recall the many friends, colleagues, students, and others – including ourselves! – who want to find the quick fix to avoid the hard work required to succeed. “The Road to Success” reminds us that there are no shortcuts. That’s a New Year’s resolution worth keeping.